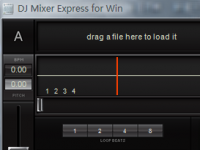 DJ Mixer Express for windows is an ideal DJ mixing software for beginners and DJ pros, It offers a robust set of features yet remains easy-to-use and affordable for a wide audience of music fans. DJ Mixer Express has an easy-to-use graphical interface that lets you automate common tasks like beat mixing, automatic-gain, master-tempo, record mixes, automatic beat and tempo detection allows you to easily match two songs for a perfect transition. Control your mix with sample-accurate cue points, or continuously loop part of a song perfectly in sync with the beat. seamlessly integrates with your iTunes, mix all your favorite songs from iTunes. Simply drag and drop, and get creative with your own music. DJ Mixer Express offers High-Quality sound with support for all major audio formats including MP3, WAV, AIFF, AU, WMA, M4A, MP4 audio format. It is used around the world by bedroom DJs and professional superstars alike.